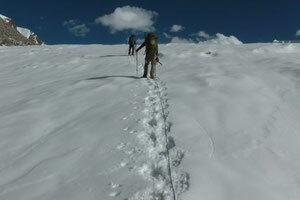 28.-29.7. ready to summit - wakhanexpedition2012s Jimdo-Page! mat and clothes for cold temperature are in our bags. ob er nicht an Höhenkrankheit leidet! betraten wir den Gletscher und hielten nach ungeliebten Spalten Ausschau. wondered if he was affected by altitude instead! have a possibility to set up a high camp for the night before the approach. The snow shoes have been very important, as the snow is very wet and heavy. Ich kann aus eigener Erfahrung sagen, Andreas hat Augen wie ein Luchs!